This a short piece which constitutes little more than a footnote. The interested reader will find it easy to reconstruct the events surrounding the crucifixion. I have not gone into the reported events narrated by Mark: ” And Jesus uttered a loud voice, and gave up the ghost. And the veil of the Temple was rent in two, from the top to the bottom. [Mk 15:37]. But no doubt some will wish to refer to this also. As is the case of many biblical and ancient narrative, it is often difficult to separate literary convention or what might now call propaganda from historical fact. It has proven to be often the case that a given narrative requires more than a bit of effort to discover the intended message and the facts of the matter. Religious texts are, as often as not, metaphorical. Indeed, the idea of a completely objective history is a fairly modern invention and not without its own problems. It has yet to be seen whether humans are capable of perfect objectivity. Nevertheless, there are some physical, astrological events such as we saw in the Star of the Nativity, that can be verified, albeit with a pinch of scepticism. The story, told in three of the four Gospels, of the darkness that came upon Jerusalem when Jesus was on the cross, fits nicely with other biblical tropes of a celestial darkness as a symbol of a spiritual reality. I’m not a dedicated biblical scholar and have little interest in the minutiae of the text at this time, as it does not serve our immediate purpose. Naturally, ancient and medieval Christians considered this to be a miracle and there was a widespread belief that this event was one of a few in the New Testament were confirmed by non-Christian sources;. However, modern scholars have discovered no contemporary references to it outside the New Testament. itself. 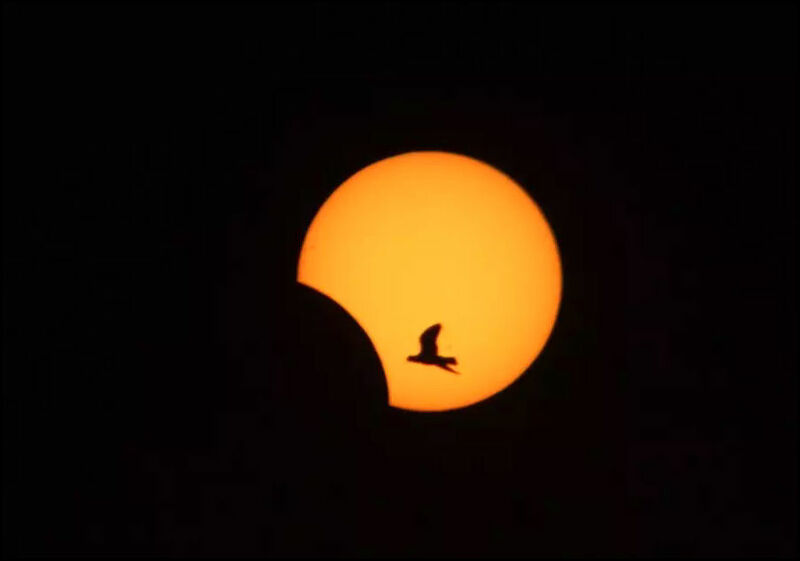 The Total Eclipse of the Sun in 0029 November 24 was quite a spectacle as shown by the image below. 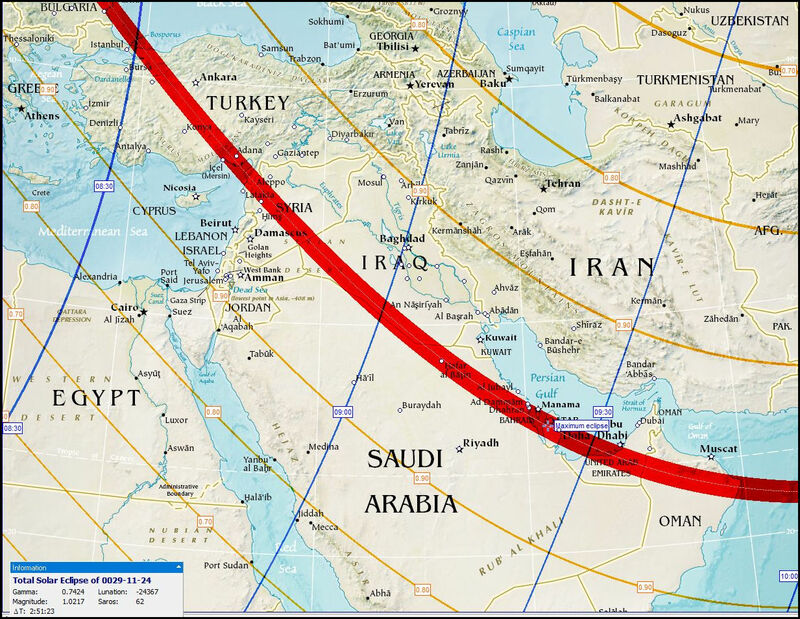 The path of totality, shown by the red swath, crossing from the Near East to the Straights of Hormuz and beyond couldn’t be missed. However, it is almost four years prior to the estimated date of the crucifixion. It becomes increasingly apparent that this is the eclipse referred to, but that was not as an actual event in 0033. It is a widespread convention in Eclipse lore that momentous events are ‘foreshadowed’ four years prior to the cataclysm. This is a misconception based, I think, on two famous eclipses that were in fact approximately of 4 mins duration. The great eclipse of 1910 is case in point and was said to have been a presage of the onset of WWI. However, the eclipse in May of that year which is credited was only visible from the Southern Hemisphere and with the exception of Austrailia was not seen in any of the of countries associated with the war that broke out in 1914. 90 was one of the years that Halley’s comet visited us and perhaps the significance of the eclipse was later conflated with that. Thank you for this article. It is really interesting. I have a question, though, if that is ok. You said that “It is a widespread convention in Eclipse lore that momentous events are ‘foreshadowed’ four years prior to the cataclysm.” Is that just for eclipses that are visible? If not, then how can one tell which event goes with which eclipse, as there are two sets of eclipses every year? I’m pleased it interested you. Yes, the eclipse has to be visible. Yes, that makes sense. Visible solar eclipses are rare enough events for this to be useful and workable. I wonder if I may trouble you with a couple of other questions. First, is there a known reason behind the four year period? I can think of several that it could be…four is a significant number on many levels, but is it specified in the lore that you mention? Second, is the foreshadowing exactly four years ahead, or is it within a four year period? I made that comment without attempting to explain why it was an idea with some currency. The reason I used the term convention was that it was an idea without a solid foundation. I have added to the article to make this more clear. The method I’m using is explained in the Eclipse of Thales article. Bartolet was very good on eclipses and lunations and related much material to the Babylonians. It has not been my experience that there is any great consensus on methodology. I’m not sure why that’s the case. It’s common to hear even experienced astrologers say things like “it might last about six months or so” no matter what the duration and oftentimes while ignoring visibility or the lack of it. Ah yes, I read the revision, and I had read the article on the Eclipse of Thales article earlier today. Yes, about the lack of consensus. 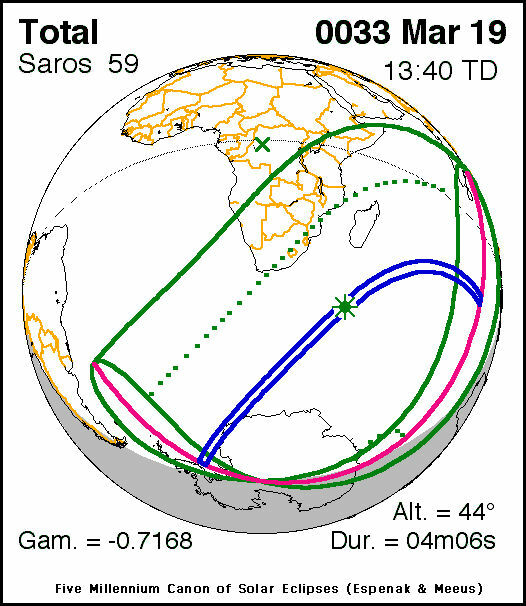 Lately, I have been doing work with Saros Series and historical events, and I have been trying to work out how much time to allow in attributing events to eclipses in the Series. That is why I was interested in the four year period of influence. From a practical standpoint, six months makes sense because that is about when the next eclipse season will occur. But of course, just because it is practical, doesn’t mean it is right. Still, I tend to use about six months, just because longer than that, I can not really know which eclipse season is the one influencing the event. Although, I have often noticed correlation in events that are associated with eclipse “year mates” as it were. Visibility is an interesting point though. We have a subscription to Great Courses Plus, and I watched the lecture series on Ancient Astronomy, which was interesting….well, reading between the lines, filtering out the modern scientific bias of the professor. But even that revealed some interesting information. I guess they have found some ancient calculations of eclipses, and the professor rather condescendingly spoke of a lot of “false positives,” with 2 sets of eclipses per year. 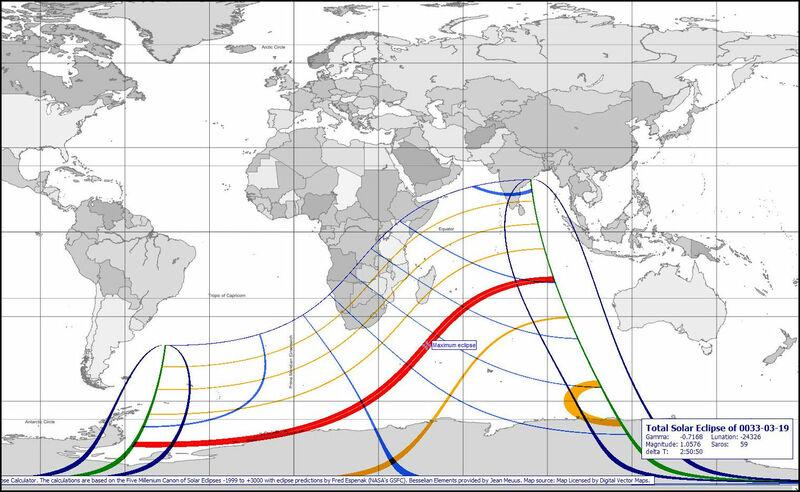 Of course, we know that there are 2 sets of eclipses every year, they are just not all visible in any given location. From the perspective of an astrologer, these supposed “false positives,” could indicate that these eclipses were given meaning whether or not they were visible. It would definitely make sense, though, to attribute a longer period of influence to visible eclipses. Although….there is a nervous making aspect to that, what with last year’s eclipse over the U.S.
Anyways, thank you very much. This article and the article about the Eclipse of Thales were quite helpful, I think! You are missing some key elements. Yes, there are eclipse seaso0ns and six months is long enough to have another one. However, they are not created equal. Moreover, the visibility factor is going to rule out most of them. If it isn’t visible, it won’t count for your location. So to say ‘about 6 months’ means that whoever said it doesn’t understand what’s actually happening. Also, as I mentioned the duration of the eclipse will provide you with the period it covers. This might be years and often is, but it may be much less than that. I understand. Sorry, I was just musing out loud about other things I had heard and read. Certainly, the approach you are explaining would be more workable and far less daunting….and involve much less guesswork overall. Although, in my research I really have noticed fascinating parallels with historical events over various Saros Series, whether or not the solar eclipse was visible. Of course, that could be due to the effects of the paired lunar eclipse(s), which are visible far more often. I wonder, can you use a similar rule with respect to lunar eclipses, a month per minute, perhaps? Cynthia, you are missing a crucial point. It’s true that individual Saros cycles tend to have a degree of shared characteristics, that in some case may very well offer us some clues. But they do not happen in all the same places. An eclipse has a primarily local effect. 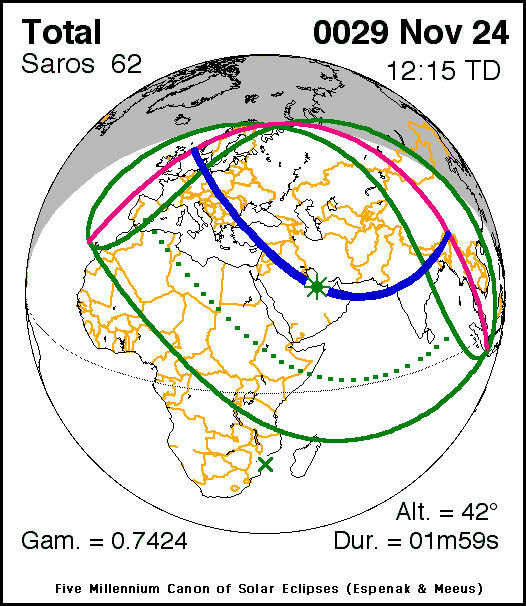 So you can say there are “parallels with historical events over various Saros Series, whether or not the solar eclipse was visible” However if the eclipse that occurred was only visible in Mongolia, the ‘effect’ won’t be shared outside of that parameter. So, I think you are making it more complicated for yourself. The formula is the same, except that the period of ‘effect; is years for Solar and months for Lunar. Yes, thank you. That is why I said that any parallels I saw must be due to the lunar eclipse(s) rather than the solar ones, as if I am not mistaken, lunar eclipses are visible everywhere in the world that it is nighttime when they occur. Yes, I agree that limiting analysis to visible eclipses cuts down on the work considerably, as you can eliminate most of the solar eclipses and probably about half of the lunar ones. Also, these formulas make a lot of sense and give a good reference point. Thank you so much, and I greatly appreciate your taking the time to explain further.